Moe the Chimpanzee was once owned by the Davis’s. (see other articles on this blog). Moe was raised like a child, even attending their wedding. Even though the couple has been quoted that Moe was nice, he still had 2 incidents of aggression (natural in Chimpanzees), leaving the victims harmed. He had lived in 4 different places in his short years, until the day he escaped from Jungle Exotics in CA. Sid Yost the trainer of Chimpanzees, (see articles on this blog), once had his facility there at Jungle Exotics, housing Chimpanzees, Lions, Tigers, Wolves, Bears and many more exotic animals. What a horrible life and a horrible ending for Moe, as with All Pet Chimpanzees. If only the Davis’s had placed him in a good facility he would be thriving today in a normal Chimpanzee Group. Moe a 42 year old chimpanzee is still on the loose after over a week. I suspect he may have been bit by a rattlesnake but we all hope he is still alive. Jungle Exotics an animal training facility in Devore, California is run by two colleagues of mine and the facility housed Moe until Friday, June 27, 2008–when the chimp escaped. I haven’t called them because they have their hands full. Animal escapes happen all the time but Jungle Exotics has always been pretty good on the safety issue. They also take care of their retired animals. When I got back from Europe I actually went to work for them for a while until I decided what I wanted to do after the culture shock of returning to the USA after a year overseas. Although accounts say Moe the chimp was rescued in the 1960s, it was more likely that he was purchased for a pet. Poachers often killed (and still kill) mother animals to obtain young primates for the pet trade. Contrary to belief, primates do not make good pets. Today, private ownership is illegal and violates the Endangered Species Act unless you meet certain provisions and are under permit. 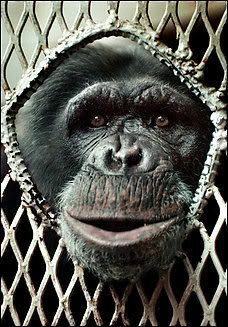 The general public has a misconception that chimps are amiable animals from images found in movies and television commercials–captive chimpanzees are not like that image–in fact they are highly dangerous. I wrote about the St James & LaDonna Davis chimp attack incident in 2005–Moe was the chimpanzee the couple was visiting when two other chimpanzees escaped and attacked St James. The attack was brutal–and it surprised people. Hello! Can you say wild animal? Have you watched any of the chimpanzee footage of them attacking and eating other primates or attacking rivals? The Washington Post did a story on the Moe Davis history and the attack incident and stated the HSUS estimate of 15,000 chimps as pets. I think that is an exaggerated figure and would like to know how they arrived at it. You can read more about this at CBS2. Jungle Exotics is a licensed facility and nearby is another company (Amazing Animal Productions) that faced charges on animal abuse (Animal Legal Defense Fund vs Yost) and was banned from working with chimpanzees as part of the settlement agreement back in 2005. Speculation around this incident exists as to whether or not Yost was in violation of the settlement agreement. Just what will provoke the chimp? That is hard to determine. Anything could but local animal control did not think Moe would be a imminent threat. Yikes! Staff must have watched those chimps in the career builder commercials. Chimps can be highly dangerous. Get a look at St James who lost his nose and a few other things during the chimp attack. Okay, so maybe because because the chimp disappeared in a fairly rural area and is in forest terrain they think he wouldn’t be a problem–but that is a risky assumption. When first asked about this I suspected that Moe would turn up at someone’s home and according to this video he first showed up at the caretakers house and then turned up at a remodeling project scaring the workers. Why authorities were not notified earlier is unknown. Chimpanzees are omnivores but are known to kill and eat the meat–but a coyote is more likely to have grabbed the neighbor’s chicken as reported in the video. I’d want to know what animal tracks were near the fence before reporting such a thing. Helicopters have not flushed the chimp and he has not been sighted since he escaped and frightened the workers. As of today, Moe the chimpanzee has been missing for just over a week. Due to the high numbers of rattlesnakes in the area–it does not look good.